The Wall, a documentary created and produced by the Arizona Republic and the USA Today Network, will provide a screening on July 16-18th in Scottsdale at the Harkins Theaters in Scottsdale. “With rare footage from some of the most remote reaches of the U.S., “The Wall” explores the impact, reveals unknown issues and details the unintended consequences of President Trump’s $20 billion promise to build a wall from the Gulf to the Pacific. 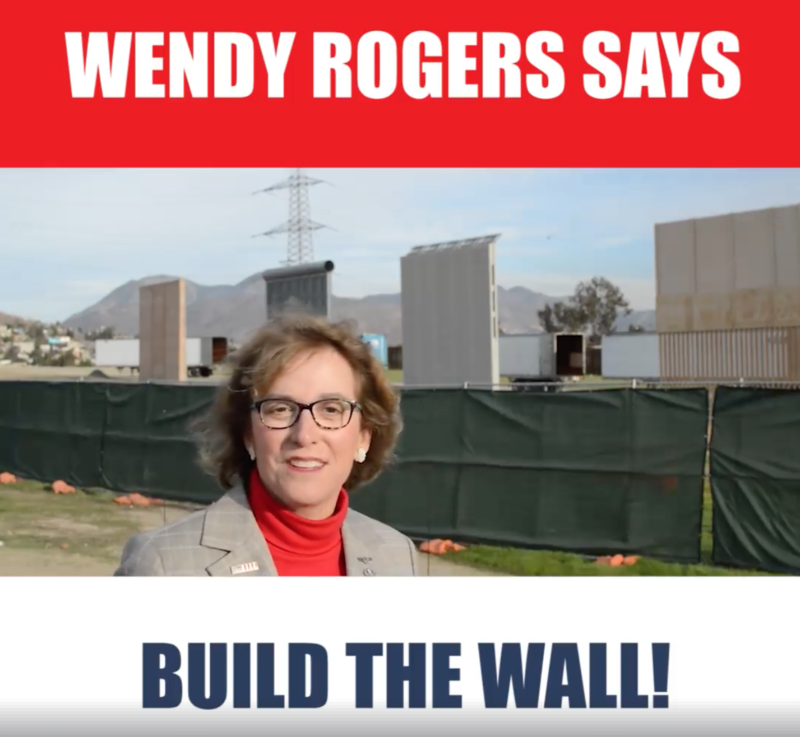 Flagstaff, AZ – Arizona 1st District Congressional candidate, Wendy Rogers, a conservative entrepreneur and retired Air Force pilot, who supported Donald Trump in the primaries, visited the border wall prototypes near the Mexican border this weekend just days ahead of President Trump’s expected visit. After inspecting the wall prototypes, Wendy Rogers gave a speech detailing her determination to build the wall, end chain migration, and fight for other key conservative immigration initiatives when elected. President Trump is expected to visit the wall prototypes this week, where he is expected to highlight his immigration initiatives, mainly to fund and build the wall. A video of the speech Wendy Rogers gave can be found on Rogers’ Facebook page. 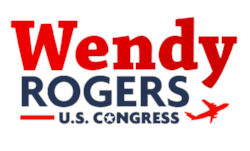 “Good afternoon, I’m Wendy Rogers, Republican candidate for Arizona’s 1st Congressional District. I’m speaking to you from the prototypes of President Trump’s border wall, which he is fighting hard to get funded and built. Our nation’s sovereignty, security, and the rule of law should be top priority for any elected official in Washington DC. Unfortunately, however, they are not. We don’t enforce our laws. We allow immigrants to enter our nation illegally. We allow drugs, crime, and gang activity to run rampant, especially on our southern border. We lose billions due to fraud, waste, and abuse stemming from our immigration programs and subsidies. 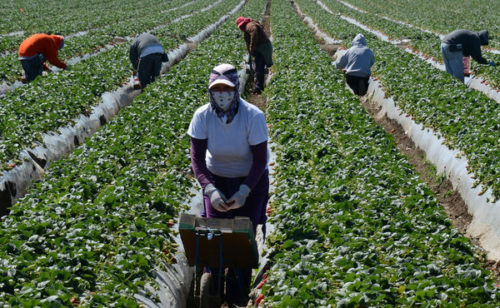 Wages of American workers continually decline because of suppressed wages from illegal immigration. I served as an American Air Force officer. I know what security looks like. What we have now is a complete and utter mess. We are losing our sovereignty and our respect for the rule of law. It’s time to do something about it. You see . . . we still have politicians who give double-talk . . . they talk about fences instead of the wall.They talk about amnesty for millions of illegal aliens in order to give us even a fraction of the wall. No! This is not what we the people voted for! We have serious problems. Our nation will not last unless we fix this, and fix it now. No more double-talk. Build the wall. No amnesty – immigrants must enter legally or not at all. Crackdown on sanctuary cities. Arrest elected officials who undermine our sovereignty. End chain migration, which is a corrosive policy that endangers innocent Americans. It should’ve have ended long ago. End the visa lottery, so we don’t have to worry about admitting terrorists. Keep the travel ban in place until countries can demonstrate they are civilized on the world stage. End foreign aid to countries who deplore us. Put E-verify in place to double-check workers who enter, so we can be sure they’re legitimate. Crackdown on MS-13. Enforce our laws! We veterans understand what security looks like. We know you don’t leave a section of your perimeter unprotected. We know there must be solid access control. And we know you need to remove bad actors. This is common sense! Wendy Rogers is a retired Air Force officer who attained the rank of Lt. Col., became one of the U.S. military’s first female pilots, is an entrepreneur and homeschool mom. Is Illegal Immigration the Fault of President Donald Trump? Over my lifetime there have always been people entering this country illegally. As a small-town Midwestern kid, I was never affected by anyone coming in and working or living in my hometown. My father was a local contractor and a union member. His men were hired from the union hall and as far as I knew, they were just regular American workers. As a young adult living in Chicago I still was not affected by illegal immigrants. We had large Polish communities, Hispanic communities, Little Italy, the Chinese community and most of the Southside of Chicago was the Black community. I hired men and women who lived all over the city and unless they did a poor job, they worked and got paid along with everyone else. If they were a payroll employee, they never received cash and they always paid their taxes. When President Reagan passed the Immigration Reform and Control Act of 1986, my support was with the President. As a person who ran a business in the construction industry I knew many of my sub-contractors hired workers who were illegal. Because they were not my employees I didn’t worry about it. Once the law passed I was happy to share the information with anyone who was not legal and help them to complete the paperwork to become citizens. I made a big deal of the new law and to my surprise some of my own employees secretly took advantage of the IRCA. Only after they became citizens and obtained a social security number of their own did I realize how many were illegal and using a false or stolen social security card. After the law was passed the problem was that many throughout the country did not take the opportunity to become citizens. Thousands stayed in the shadow from fear of the government but more importantly, many didn’t come forward because they didn’t want to pay taxes. The fact was most of the sub-contractors I hired used illegals as cheaper labor. Not because they paid them lower hourly pay, but because they didn’t have to match the Medicare and Social Security taxes, and they didn’t have to pay unemployment or union dues. When the law passed many of those companies made the effort to get all of their people to come forward but I remember that many who would work on my jobs suddenly disappeared. After the IRCA the government promised to fix the border issues but we all know that did not happen. People continued to hire illegal immigrants. Women loved having them clean their houses and keep their yards manicured. Many became nannies and many worked in eldercare. The farmers wanted them to pick the crops, the builders wanted them to clean up job sites and haul materials. My experience was most Americans hired Hispanic workers because they are hardworking and respectful not because they were cheap. I knew people who considered their domestic help part of the family. But no matter how much Americans loved the illegals they were in the long run still illegal and the problem became bigger and bigger. Sooner or later it had to break. I am a strong supporter of President Trump and I am proud to be standing with him. However, we have to find a way to fix this problem and calm the country down. Many of the protesters in Charlottesville, Boston and Phoenix were not there because of the Hispanic population they were there because they are of the mind that Donald Trump is a bigot and a racist. I would also guess that better than 50% were there because Hillary Clinton lost. If 10% of those protesters ever spent one minute working with our state social services that try to help children and families, they would understand the problem is not this President. The problem lies with the previous administrations dating all the way back to President Reagan who never did anything to improve and promote the current immigration laws and that includes Barack Obama. Instead of promoting the likes of Antifa and Black Lives Matter, stand with people like me who are demanding the government address the system of legal immigration now. Let’s hold Democrats and Republicans alike to their promises during campaigns to reform the system. Let’s be committed enough to vote out the politicians who use excuses for doing nothing. Americans should stand together on this issue. 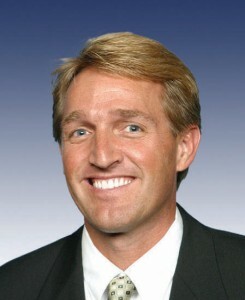 Senator Jeff Flake recently posted the following opinion piece on Medium. We can all agree — the President, Republicans and Democrats in Congress, and people all across the country — that we need secure borders. I also agree with the president that having a secure southern border requires physical barriers. The question is: what type of physical barriers are best? And how can technology and surveillance fill the void when physical barriers are not feasible? I’ve been working on this issue with some of my colleagues for years. The bipartisan immigration reform bill that passed the Senate in 2013 (which I helped author) provided for 700 miles of fencing, including “double fencing” in some areas. This was in addition to doubling the number of border patrol agents from 20,000 to 40,000 as well as providing a host of other technological and border infrastructure improvements and significant additional resources to prosecute illegal border crossers. Throughout the campaign, President Trump spoke extensively of “building a wall” along the southern border and his first budget asked for funding for “bricks and mortar” for a wall. I understand what he’s trying to accomplish, but there are there better ways to secure the border than a “brick and mortar” wall. The closest thing we have had to a “wall” along the southern border were the surplus Vietnam War-era “landing mats” that are turned upward and placed end-to-end through some of the border communities. Because border patrol agents couldn’t see what was happening on the other side of the wall, rocks were often thrown over them, causing injury to agents and damage to border patrol vehicles. Consequently, these walls have largely been replaced with fencing. It’s important to understand what sort of fencing we are talking about. It’s not a short chainlinked fence or a barb-wired fence you’d see on a ranch. We’re talking about a solid steel structure that often rises 20 feet above the ground but has narrow gaps allowing border patrols agents to see through to the other side. I was pleased that during his visit to Arizona this week, President Trump traveled to the border community of Yuma, where “landing mat” walls have been replaced with fences, to great effect. I would invite the President to visit other stretches of the border in Arizona where walls have been replaced by fences in border communities. I should note that in some remote, mountainous areas, even border fences aren’t feasible because of the landscape. In these spaces, sensors, camera towers, and drone surveillance can help fill the void. There are other issues with border walls. For example, the San Pedro watershed near the town of Naco in southern Arizona empties northward across the border into Arizona. A brick and mortar border wall would be either be breached during the monsoon season, or it would flood border communities on the Mexican side of the border. Even the current border fences in that region need storm gates to allow debris to escape northward through the border fence after a good rainstorm. If the “border wall” is simply a metaphor for increased border security, which includes a mix of fencing, sensors, towers and drone surveillance, I strongly support the President. Arizonans have been working on this issue for years, and the downward trend in illegal border crossings over the past few years has been encouraging (owing both to better border security and an improving economy in countries south of our border). But an actual brick and mortar border wall is not the most effective or efficient way to secure our border and keep Arizona safe. Phoenix, AZ (May 4, 2017) – Arizona is the catalyst for then candidate-now-President Donald Trump where he planted the flag opposing illegal immigration and building a wall along the U.S./Mexico border. We commissioned a poll with multiple questions and the border wall question was one of them – the results were shocking. Methodology: This live and automated caller survey was conducted by Phoenix based-OH Predictive Insights on May 1st, 2017, from an active Arizona registered voter sample. The sample size was 401 completed surveys, with a MoE of +/-4.89%. 35% of surveys were conducted on cell phones and 65% via land lines. The party affiliation, geographic, gender and age demographics accurately reflect active registered voters in Arizona in this sample. Phoenix, AZ – Americans want tax reform but are deeply opposed to a proposed Border Adjustment Tax (BAT), according to a new national survey released today by Americans for Affordable Products. A strong majority (63%) of voters oppose the border adjustment tax, including 46% of voters who strongly oppose this proposed tax. Key constituencies showed particularly strong opposition to the proposal including women (70%) and senior citizens (63%). The Tarrance Group fielded the survey of 800 likely voters from April 2-5, just ahead of the congressional spring recess. The survey finds that opposition to the BAT’s 20% tax on goods and products imported in the U.S. sharply increases when voters learned of the potential economic impact it could have on them. More than 70% are less likely to support the BAT when they learn it could increase costs for food and clothing by $1700, gas by as much as $.50 per gallon, and car payments by $100 per month. 76% are less likely to support the BAT when learning of the increased price in medicine and prescription drugs. The costs of the BAT to businesses would lead to job losses and unemployment across multiple business sectors. 73% of voters are less likely to support it when they learn that it could increase the unemployment rate. The reality is setting in for many that the controversial Border Adjustment Tax is a “poison pill” to enacting the pro-growth, comprehensive tax reform that President Donald Trump is calling for, and American consumers and job creators badly need. Opposition to the Border Adjustment Tax is widespread among Senate and House lawmakers, and more importantly among voters. Fortunately, both Arizona Senators John McCain and Jeff Flake have expressed their concerns over the BAT. To view a summation of the survey data, click here. To obtain a full list of the AAP coalition, click here. Americans for Affordable Products is a coalition of job creators, entrepreneurs, business leaders and consumers united against higher prices on everyday necessities. To learn more, please visit: www.KeepAmericaAffordable.com. Phoenix, AZ – Today, Americans for Affordable Products, a coalition of nearly 200 businesses, local organizations, and trade associations united to stop the Border Adjustment Tax or BAT, and its resulting increased prices on everyday necessities, thanked Senator Jeff Flake (R-AZ) for speaking out on the U.S. Senate floor to raise his concerns with the BAT. The Border Adjustment Tax is a provision of House Speaker Paul Ryan’s (R-WI) tax reform plan, which, if enacted, would levy a 20 percent tax on imported goods. If enacted, the Border Adjustment Tax could result in American consumers spending an additional $1,700 per year on basic necessities like food, clothing, medicine and gasoline. To schedule an interview with an Americans for Affordable Products representative, please email press@KeepAmericaAffordable.com. First, I must say I am very relieved that Donald Trump beat Hillary Clinton. There certainly is a delicious pleasure in that victory. Now, let me get the mea culpa out of the way. Like many of my colleagues in the professional political consulting class, I was wrong about the election of Donald Trump. Nearly every polls showed him losing – the pollsters were wrong. Every time Donald Trump spoke, he polarized and divided groups of individuals. The public relations professionals were wrong. Nearly every longtime Republican and conservative leader said he couldn’t win using his strategy. They were wrong. I repeatedly said he needed to learn from the lessons of 2012 when it comes to millennials, women and minority groups and affirm their libertarian and conservative values. The leader of the Grand Old Party needs to pursue a mathematical strategy of addition and multiplication rather than subtraction and division if they want to grow the party. Apparently, there was some “new math” at work in this election. During the last days of the election, I believed it came down which demographic groups would turn out for Donald Trump. Would women, Latinos and millennials overcome the intensity of angry, aging, white, blue-collar Americans? Donald Trump obviously heard the voices of the latter and hit a nerve. 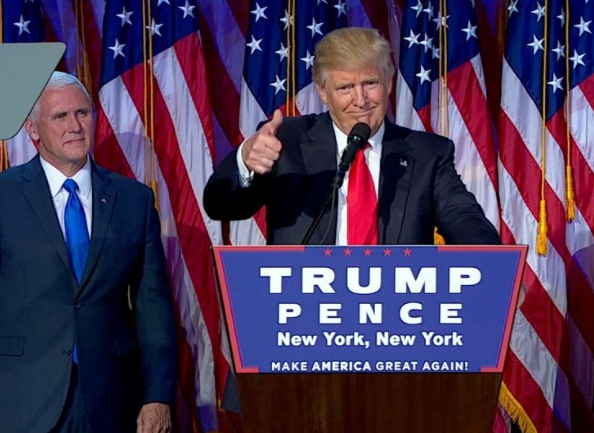 Donald Trump managed to pull off one of the biggest political shocks in American electoral history and we, the political consulting class were wrong. But while we may remain wrong on why Donald Trump got elected as our 45th President, we may very well be right about our earlier concerns. Donald Trump has “caught the bus” and must now grasp the sobering reality of governance. There are also the thousands of executive staff Trump will need to replace. Will he pull from the thousands of individuals with Washington experience who work as lobbyists, hill staffers and interest groups to fill those positions? Or will he bring in new blood from the heartland? I believe the former. Do you see where I’m going with this? If President Trump truly wants to be successful, he needs experienced talent and there’s really only one pool to pull talented individuals – the establishment. Candidate Donald Trump promised an agenda to make America great again during the campaign. Can President Donald Trump deliver on those promises? I believe he’s going to find it harder than he expected. Do we really believe President Trump will be able to build an impenetrable wall along the southern border and make Mexico pay for it? Will President Trump sign an executive order banning all Muslims from entering the country? Can we expect President Trump to tear up NAFTA in one swift move? His establishment cabinet and advisers are about to tell him just how hard governing really is. The reality is President Trump has nothing to fear from the political left. He’s survived that battle and won. The real threat to a Trump administration is from those who wanted to burn Washington down. We’re about to find out how assimilated Donald Trump will become to the swamp he wants to drain. Ted Cruz may prove right about Donald Trump’s northeastern values and mid-westerners may not be happy. There is much to be hopeful and excited about however. Republicans now control Washington, DC. Let me say that again. Republicans now control the Executive and Legislative branches of government. This is huge! President Trump and the Republican Congress have a critical time frame to accomplish as much as possible and that starts with securing as much of the Judicial branch of government as possible. The first 100 days of a Trump Administration means cleaning up the mess from the last eight and even 16 years. The Republican congress finally has a President who will not veto a repeal of the Affordable Care Act. They need to drop that bill on Day 1. President Trump has other monumental tasks that he can single-handily accomplish: rescinding the hundreds of executive orders of Barack Obama; tearing up the Iran Deal; changing leadership and overhauling the VA; reigning in the powers of the many regulatory agencies, and restoring morale among the men and women of our military branches. It’s a lot to do and he should not meet any resistance from a Republican Congress. In this area, he not only needs to be assertive. President Trump needs to be aggressive. Getting the “relatively easy” tasks done quickly will allow President Trump to focus on his more long-term and ongoing agenda such as restoring the courts; protecting religious freedom; repealing Dodd-Frank; reorienting energy policy; rebuilding the military; reforming immigration; improving national infrastructure and improving international trade relations. Finally, President Trump needs to avoid picking fights with Congress over politics. There is no time to waste on grudges or personality conflicts. The American people want major action and no drama. These types of antics will only send the GOP down a box canyon where they will be massacred in the 2018 mid-term elections. While I was wrong about the election of Donald Trump, I hope I’m not wrong about President Trump. Like many movement conservatives, I will remain steadfast on principles and policy and speak up when I believe his administration is wrong. Donald Trump deserves our congratulations, prayers and well-wishes. He has been chosen to carry out the single-most powerful job in the world and we must support him as the leader of the free world. As the General Election approaches, Republican Congresswoman Martha McSally has released two new ads in the race for Arizona’s Second Congressional District. Martha McSally will face off against liberal Democrat Dr. Matt Heinz in the General Election.